Rebelution have blown up into one of largest reggae-influenced acts on the market. Multiple national tours as well inclusion in popular summer festivals, such as Austin City Limits and Lollapoloza, have helped spread this band’s message over their eight year existence. The band’s newest single, Counterfeit Love, has already been viewed over 20,000 times in only a week and is available for free download from the band’s website. MusicBailout.net was lucky enough to get a chance to speak with frontman Eric Rachmany just days before the filming of their live performance right here at Stubb’s BBQ in Austin, Texas. 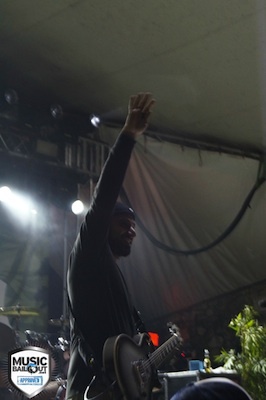 The performance at Stubb’s was nothing less than amazing. Hot Rain dropped the reggae mood as the crowd grew larger, and they continued to bring excellent musicianship as a backing band for the gifted vocalist, J-Boog. From the moment the curtain hiding a giant Rebelution backdrop was revealed and band members took to the stage, the crowd and the band alike never let up. The addition of a two-man horn section, made up of Khris Royal and Mike Eiya, made this Rebelution show a deep and rich sonic experience. The live sound was ran exceptionally well by Errol Brown, former sound engineer for legendary acts including Bob and Ziggy Marley. Brown was responsible for helping the band record Peace of Mind and MusicBailout was informed that Brown is also the producer of Counterfeit Love. While Mr.Rachmany informed us they do not currently have any plans for a new full-length album at the moment, he did express the wish to release a live concert DVD. What better way to make your live recording debut then in the footsteps of Matisyahu and doing it Live at Stubb’s? No word was given to MusicBailout on when the performance would be released, but once it does, this night that we won’t soon forget will be able to be shared with everyone. From extended solo sections and acoustic performances, to auxiliary percussion and blaring saxophone harmonies, all the way to excellent stage lighting work, this concert was one of the most fun I have been to in a long time. The amount of hard work from every crew and band member paid off into one great experience. When I spoke to Eric, the band was settled and taking an off day in Amarillo, Texas. For those not familiar, Amarillo is a small stereotypical Texas city, much different then these Santa Barbara natives are used to. Eric joked about the lack of any form of real entertainment in the town saying it might just be a “movie day”. Eric’s demeanor over the phone was friendly and thoughtful. His words seemed to speak with such fluidity that he always seemed to be one step ahead of his mouth. When asked about the band’s progress and future in the music industry, Rachmany seemed very content and positive. Eric: We do this because we love it. It feels so good when you see people smiling out in the crowd. The lights on you, the sound is full and everything is so vibrant. I think it’s really difficult to make a living off of music. We’ve been really fortunate to be able to do this. I think a lot of the best musicians in the world and some of the best songwriters are never heard. They never get the opportunity to make a living off of their artwork. We definitely put in a lot of effort from the get go. When we first started out in Santa Barbara we played a ton of shows. Everyone has different needs in life. For me, I don’t need a big house, and three cars, and a huge family, and a big swimming pool. I live with my mom right now, and I love it. Everybody is different, for me, I can be a musician because I don’t really need much. We do it for the music. Eric: I’m always down to collaborate, it’s just really hard for me to collaborate because I’m just one songwriter. The Thrive song, the music they sent just hit me, and I really love their music. I was able to write a tiny verse for it and I loved the concept of the album. Those guys have such a positive message. Same with Tribal Seeds, they’re great, humble guys. Definitely have known those guys for a long time. Marley, our bass player, actually grew up with a couple members of Thrive. It’s nice to see good friends writing good music. We asked Eric what the band does during their off time on tour. Eric: You can’t be in a band for eight years if you guys aren’t friends. I’m so lucky to be able to play with the people I play with. The music we make is encouraging and tries to motivate people. That’s exactly what my band mates do. They motivate me, and I try to motivate them. We’re constantly trying to become better musicians and better performers. In that way, I’m truly lucky to be with them. In the down time, I’m lucky to spend it with them. I definitely try to protect my voice. Playing 4 or 5 shows in a row can take a toll. I try to take care of myself and stay healthy so I can be 110% for our live shows. Eric: Once you record a song and you listen to it so many times. It’s almost like that’s just the way it’s going to be. Sure there might be a couple of things here and there I wish I’d played a little differently. I think that’s what sets our live shows apart. When people come here us live they want to hear some stuff just like the album, but they also want to hear something a little different. I think our songs are constantly evolving in our live performance. If you take a song like ‘Otherside’ from our first album Courage to Grow, we wrote that song maybe a week before we jumped in the studio. When I listen to that song now, the studio version, it’s like the most simple basic recording possible. There weren’t a lot of layers or overdubs. Now when you look at our live performance of that song there are all sorts of solos and weird sections. It’s turned into a 7-minute song when we play it live. I think our live show sets it apart from the studio version. During the interview I found out that Eric had originally started as an acoustic singer/songwriter. He spoke of his influences such as Dave Matthews Band. He seemed to enjoy the recording of Peace of Mind Acoustic as a way to get back to his roots. He said the acoustic version was recorded in just a few days. At the end of the interview, Eric gave a shout out to MusicBailout.net. 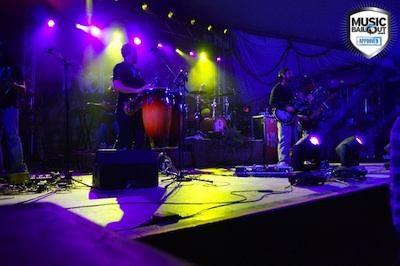 We would like to return the favor and give one right back to Rebelution for providing Austin with another memorable night of live music, lights, and dancing. The reach of inspirational music is far and wide and these boys continue to put in the hard work and effort needed to spread their “Good Vibes”.